“Parachutes... Alligators... Murderers... Women… You think it's easy? Only for a great adventurer like me!" 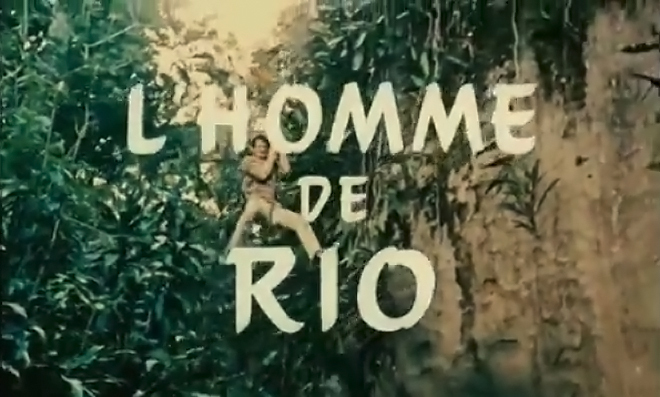 Movie taglines can often be accused of misrepresenting the films they are designed to market, but nothing could be further from the truth in the case of 1964’s That Man from Rio (L’Homme de Rio). Director Philippe de Broca’s globetrotting adventure features all of the above – and so much more – and also happens to star two French film icons: Jean-Paul Belmondo and Françoise Dorléac. 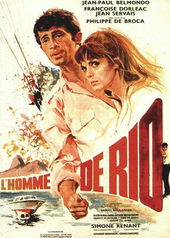 Belmondo plays Adrien Dufourquet, a soldier home on leave when his fiancée Agnès (Dorléac) is kidnapped by mysterious thieves and hauled off to Rio de Janeiro. The chase is on as Adrien pursues Agnès and her abductors to Brazil – letting absolutely nothing and nobody stand in his way. Dorléac and Belmondo are a perfect pairing for this high energy caper, with the former proving to be far more than a damsel in distress and latter tearing through the film with the sort of breathless bravado that would inspire countless everyman action heroes. The scene featuring the multi-coloured curtains. Set to a fast-paced samba number composed by the legendary Georges Delerue, That Man from Rio’s titles are an equally brisk affair. 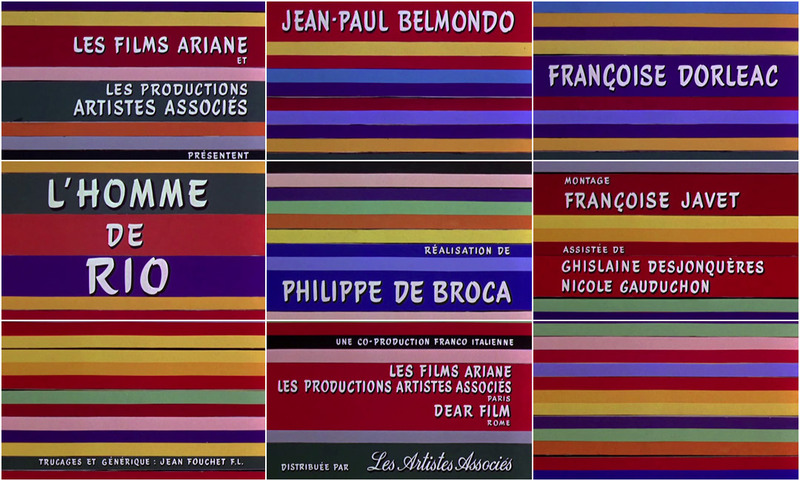 Designed by Jean Fouchet, the opening credits roll on and off screen affixed to coloured horizontal stripes, their rotation synced to the beat of the bateria's drums. 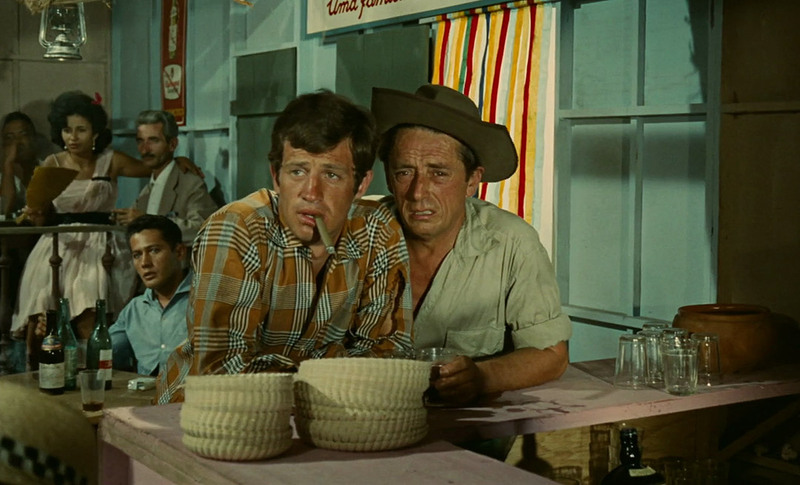 The colour scheme is taken directly from a bar scene later in the film that features similarly coloured strip curtains. That Man is a movie that’s going places, so the backdrop is purposefully reminiscent of the flap displays still found at departure gates in airports and train stations around the world. Produced in the wake of the massive commercial success of the James Bond series, That Man from Rio was, by de Broca’s own admission, heavily influenced by the work of Belgian cartoonist Hergé. Many of the film’s visuals and plot points are ripped directly from the pages of The Adventures of Tintin comics, specifically 1935’s Tintin and the Broken Ear (L'Oreille cassée). With its mixture of humour, action, exotic locales, and archaeological artifacts, That Man was influential in its own right, and is often cited as a key inspiration for one of cinema’s greatest adventurers: Indiana Jones. Raiders of the Lost Ark director Steven Spielberg later wrote to de Broca to tell him that he'd seen the film nine times!